It’s another win for Paris. 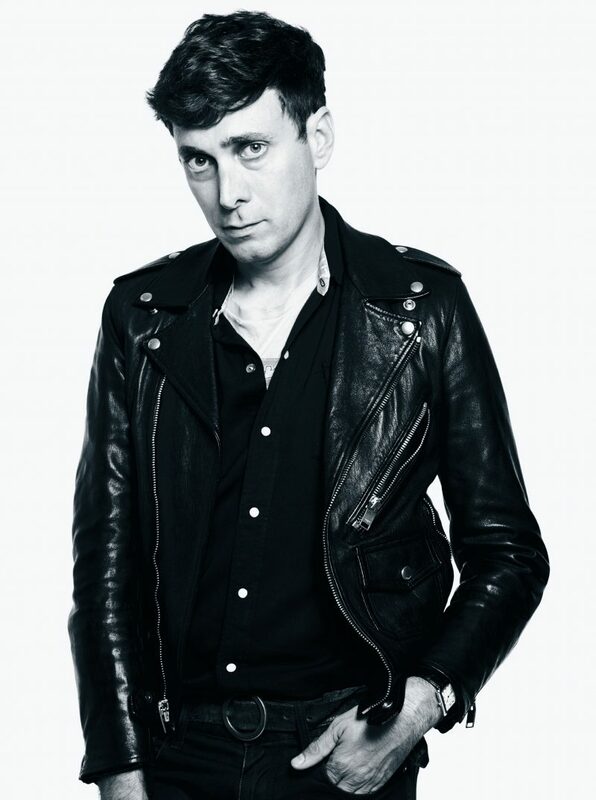 The news of Hedi Slimane replacing Phoebe Philo at Celine kept the fashion tongues wagging. 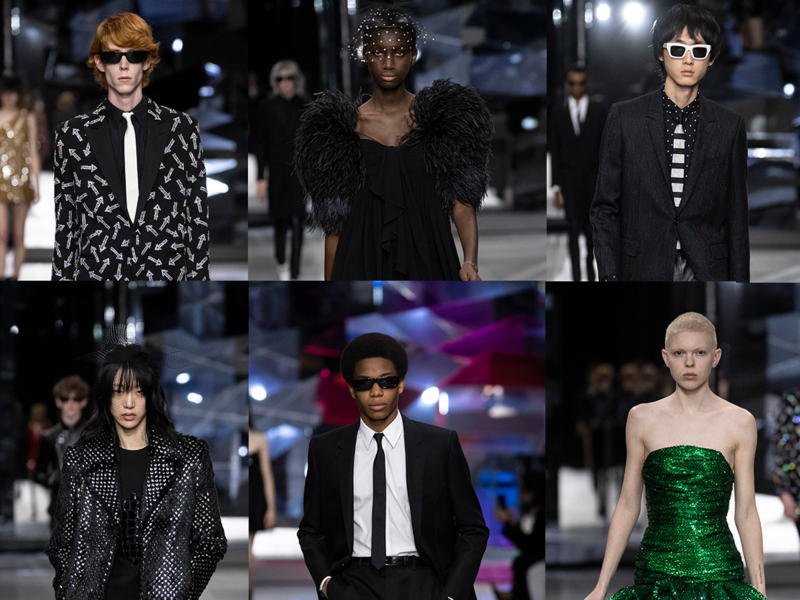 In our humble opinion, Slimane might have gotten himself the best contract in fashion from Bernard Arnault including starting a men’s and Haute Couture line plus overseeing the perfume and beauty business. Let’s not forget, for a house which has not too much of a history apart from Philo’s means it’s carte blanche for the best image maker of the new millennium. At Saint Laurent he even sent out press releases reminding everyone that he had nothing to do with the beauty advertising and now, it’s all part of his package and reign. But what we find the most interesting news is regarding Paris. It seems like Slimane is back from Los Angeles and more or less a Parisian again. He outed himself as a flâneur in his first extensive interview with Le Figaro’s Laurence Benaïm this week, confessing that he loves to cross the Seine and just walk through the neighborhoods, especially the Rive Gauche and enjoy the Paris nightlife. No surprise he celebrated his 50th at the Palace in Paris and not the Palladium in Los Angeles. In the interview he even talks about Los Angeles being a closed chapter for him where the rampant real estate development has left no breathing space for creativity and youth culture, which he is so attached to. 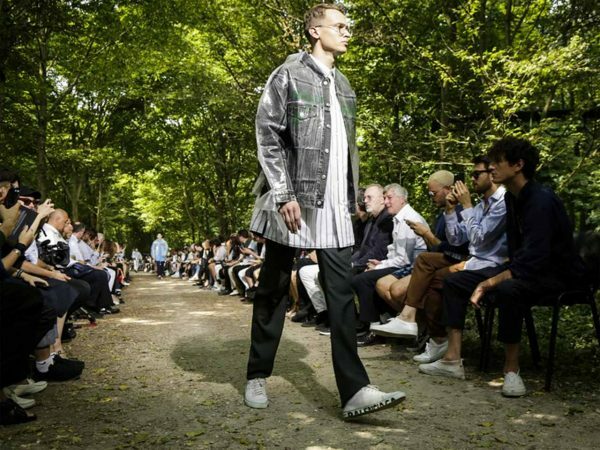 He says he has not taken a final decision yet on where to live but seeing his first Celine last night where a duo of French military regiment drummers opened the show made clear that Slimane is valuing the French patrimoine more than ever. 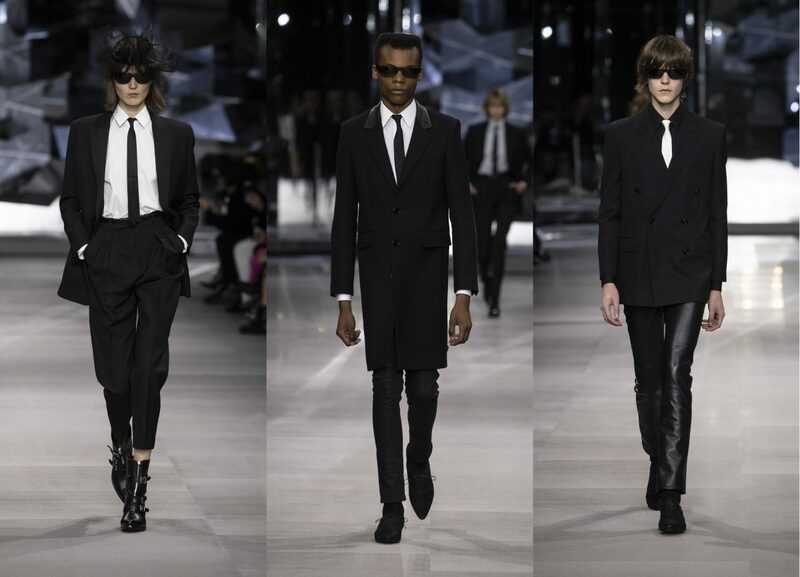 It seems that Slimane has decided that the new Celine is more about fabric than silhouette. 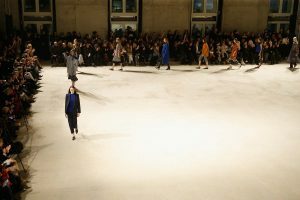 The first Haute Couture second skin shape look vowed while the outside-exaggerated pockets on pleats talked cut and line. 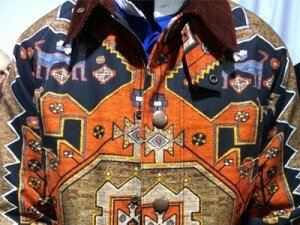 All the fabrics looked new, fresh, amazing and desirable. Tailoring had matte finish gabardine cotton, which moved but held shape, and the black leathers were soft but at the same time rigid with an appealing shine. Slimane is a man who thinks in phases. Don’t expect a color firework from his first show, as he probably already knows when he is introducing it to a future runway. So the debut was mostly in black and white and shades of grey with lots of shiny silverware on belts and jackets. 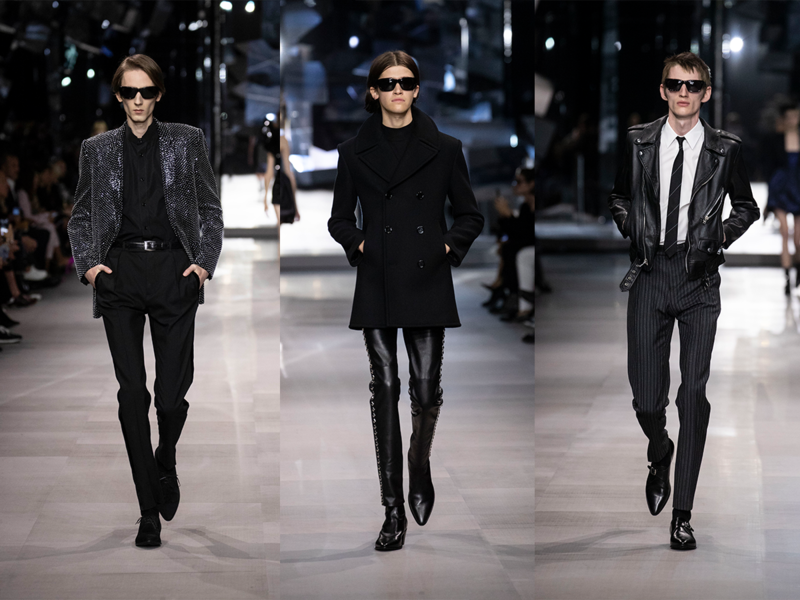 From his first steps at Yves Saint Laurent, Slimane is obsessed with cut and line. He loves to make jackets, coats and Perfecto’s, which speak to the strength of an atelier but at the same time are so fresh that his young cast and customer can appropriate them. 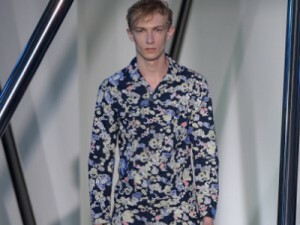 All the men’s tailoring simply awed. To be honest, we didn’t know a single face in the line up but would love to meet them all. 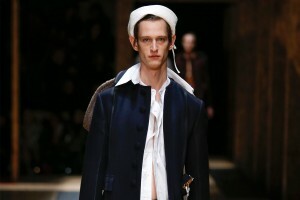 There was a cool and regal sense of young sophistication to the catwalk proceedings. 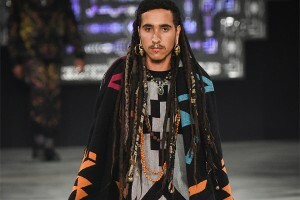 Berliner Modewoche AW17/18: Alles so schön im Fluss hier!